Every year on April 28, we observe Workers Memorial Day to remember those who have suffered and died on the job from workplace injuries and diseases. It is our opportunity to renew our efforts for safe workplaces and bring together workers, their families, community-based worker centers, unions, environmentalists, and other health and safety advocates in a unified effort to alert the public and the government to our outrage and our demands for action that leads to better workplace health and safety. Four decades ago, Congress passed the Occupational Safety and Health Act, promising every worker the right to a safe job. COSH groups and our allies have fought hard to make that promise a reality—winning protections that have made jobs safer, saved hundreds of thousands of lives and prevented millions of workplace injuries and illnesses. But our work is not done. Many job hazards are unregulated and uncontrolled. Some employers cut corners and violate the law, putting workers in serious danger and costing lives. 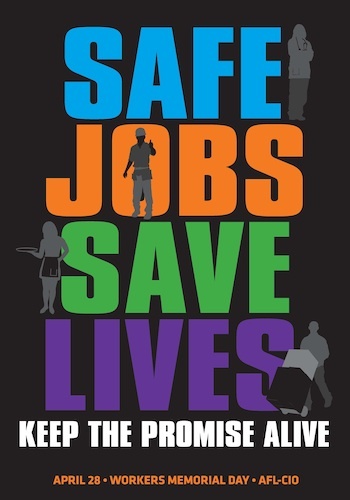 Each year thousands of workers are killed and millions more injured or diseased because of their jobs. For access to a Workers Memorial Day factsheet please scroll below. Friday, April 27, 2012 | 12:00 noon to 1:30 p.m.
MassCOSH plans to issue a joint report on workplace fatalities in Massachusetts. 5th Ave and Main St, Bayshore, NY. Co-Sponsors: WFSE Local 1488/AFSCME Council 28, UAW Local 4121, ML King County Labor Council, WSNA, SEIU 925, UW United Students Against Sweatshops. Thursday, April 26 2 p.m.
Labor and industry Central Building in Tumwater, Wash. In addition to the National COSH, a number of other organizations also sponsor Workers Memorial Day events. You can learn more about them by clicking on these links below. Updates will be posted on the National COSH Website. Please let us know of additional events.